JT is the official Technology Partner for a world-class triathlon event being held in Jersey next month. 50 of the world’s leading male and female triathletes. This includes 25 olympians from around the world who will compete in Jersey, British Isles, for the Super League Triathlon crown on Saturday 23 and Sunday 24 September. The line-up will include the UK’s Jonny Brownlee, Mario Mola Diaz from Spain, South Africa’s Richard Murray, three-time Olympian Flora Duffy from Bermuda, and Jersey’s own Dan Halksworth. Therefore, two days of intense competition will be televised and streamed around the globe. JT is also providing technical support, mobile communications and super-fast internet access to the broadcast team and race organisers. JT has pedigree in this area: two years ago, the company was Technology Partner to the successful 2015 Island Games in Jersey, providing the technology to make the Games the most connected in its history. Graeme Millar, Chief Executive Officer of JT, said: “A world-class event needs world class infrastructure, which JT is well placed to provide. Because of our investment in our mobile and fibre networks, a significant sporting roadshow like the Super League Triathlon can arrive in the Island and broadcast to millions of people with relative ease. Super League Triathlon aims to bring mainstream attention to triathlon. Moving the sport into the ‘big league’ of sport entertainment. Athletes compete in a series of rounds which incorporate the three disciplines of triathlon over short ‘super-sprint’ distances. 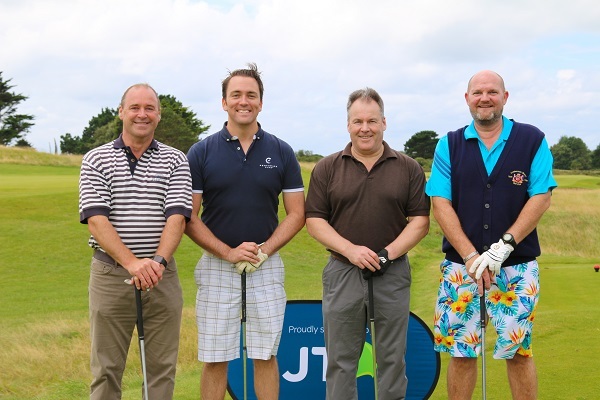 The annual Autism Jersey golf day, sponsored by JT, took place on Friday 11 August at La Moye Golf Club raising over £20,000 for the charity. A dry day and yet another excellent turn-out ensured the success of the day. This involved 22 teams enjoying a round of 18 holes followed by lunch. This was served in the nearby Les Creux Bowls Club due to the refurbishment of the club house. A raffle and auction, including a golf flag signed by Henrik Stenson, winner of the 145th Open Championship, boosted the funds raised. These will go directly towards the development of a purpose-built Autism Centre in Jersey. The winning team was Kedge Capital with an outstanding score of 94. Followed by Continuum with 91 and Estera with 89. Meanwhile, individual prizes went to Dan Burchell of CPA Global for the men’s longest drive. Also to Brona Lambert of Moore Stephens for the women’s longest drive. Finally, to Steve Morgan of Quilter Cheviot for nearest the pin. Autism Jersey aims to raise at least £1.5 million for the centre in a joint effort with the States of Jersey. It is envisaged that the centre will be operational in 2019. Issued by Julien Morel at Direct Input. Telephone 01534 735253 or email julien@directinput.je for more information. JT has seen a 100% increase in customers’ data usage while abroad since reducing roaming rates by 95% at the start of the summer. JT was the first local telecommunications provider to introduce significant roaming reductions. This means that customers are enjoying savings of up to 85% when compared to other local providers. Plus with a roaming ‘bolt-on’ JT customers can now roam for as little as 10p per MB in the UK and France. On average customers have already doubled their communications activity while roaming. They make 20 minutes of outbound calls, send 33 texts and are now using 145 MB of data. This is equivalent to streaming close to 5 hours of music on Spotify. Now, also with the introduction of 4G roaming only from JT, JT is the first to offer the most flexible and cost effective all round roaming offer. Plus, with super-fast connectivity. For customers travelling to the UK and Europe, downloading maps, accessing emails or sending large attachments and uploading holiday snaps, it is as quick and easy as it is at home. As the Channel Islands are not part of Europe, local operators are still charged to connect their customers by the international telecoms companies. JT’s FREE Apps, which let customers monitor their usage in near real time. Adding a Roaming bolt-on to their account for just £5 per month will further reduce data charges to as little as 10p per MB in the UK and France. Using Wi-Fi whenever possible is another way to control costs. Plus JT Fibre customers can access over 20 million FREE JT Fon Wi-Fi hotspots around the world. Issued by Hannah Reed at Direct Input. Telephone 01534 735253 or email hannah@directinput.je for more information.